Is it time to board up the BAU? Has the Criminal Minds TV show been cancelled or renewed for a 15th season on CBS? The television vulture is watching all the latest TV cancellation and renewal news, so this page is the place to track the status of Criminal Minds, season 15. Bookmark it, or subscribe for the latest updates. Remember, the television vulture is watching your shows. Are you? A CBS law-enforcement procedural, Criminal Minds stars Joe Mantegna, Paget Brewster, Matthew Gray Gubler, A.J. 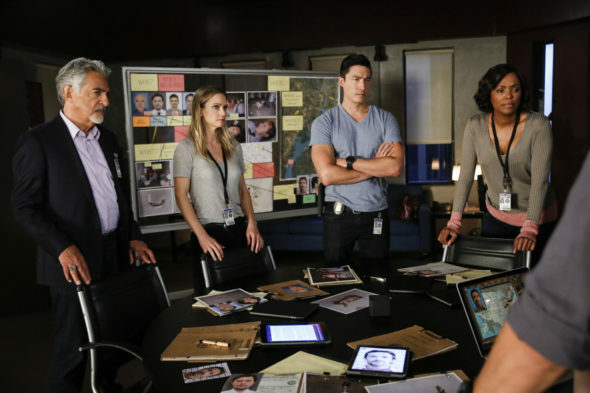 Cook, Kirsten Vangsness, Adam Rodriguez, Daniel Henney, and Aisha Tyler. The crime drama series follows the FBI’s elite Behavioral Analysis Unit (BAU) out of Quantico, Virginia. The BAU remains dedicated to understanding predators’ motive and triggers, in order to stop them before they strike again. The 14th season of Criminal Minds averaged a 0.76 rating in the 18-49 demographic and 4.67 million viewers. Compared to season 13, that’s down by 23% and 19%, respectively. Find out how Criminal Minds stacks up against the other CBS TV shows. On January 10, 2019, Criminal Minds was renewed for a 15th and final season. The 10 episodes will begin airing TBD. Stay tuned for further updates. Will CBS cancel or renew Criminal Minds for season 15? Thus far, CBS has only ordered 15 episodes for this year, but that could change. If the network does want a 15th season though, the studio will have to make new deals with the cast, which means higher costs. Right now, I think it is likely to end, so I’ll keep an eye on the ratings and update this page with breaking developments. Subscribe for Criminal Minds cancellation or renewal news alerts. **Status Update 1/10/2019: CBS has renewed Criminal Minds for a 15th and final season. Details here. TV show ratings are still important. Follow Criminal Minds‘ weekly ups and downs. Find more Criminal Minds TV series news or other CBS TV show news. What do you think? Should the Criminal Minds TV show be cancelled or renewed for a 15th season? Are there more stories to tell, or is this a good place to end the series? Criminal Minds: Season 14; CBS Crime Drama Renewed — Will It Be the End?? Criminal Minds: Beyond Borders: Cancelled or Renewed for Season Three on CBS?